Tesla‘s shareholders have approved CEO Elon Musk’s 10-year compensation package. If Musk meets his targets, Tesla’s market cap would rise to $US650 billion. The company is worth around $US55 billion now and is struggling to meet production goals for the Model 3 mass-market vehicle. Tesla shareholders have approved CEO Elon Musk’s massive new 10-year compensation package. If Musk hits a series of performance targets over the next decade, the carmaker’s market cap would rise to $US650 billion from roughly $US55 billion today. “The grant gives Musk $US2.6 billion in stock options in 12 tranches that each vest as the company hits key performance milestones over 10 years,” CNBC reported. 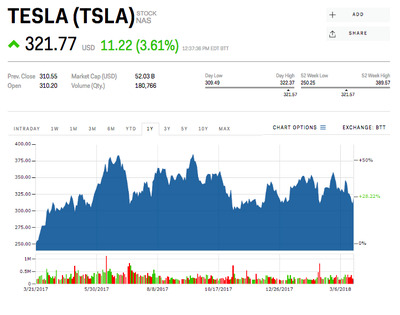 Tesla stock surged on Wednesday by almost 4% to $US322.